Illustrated by Australia's leading picture-book artist, this is a surprising and delicious story that will lift you off your feet and whirl you away. A coat in a strawberry patch flies off with a down-at-heel man, and together they have the night of their lives. A bold and original picture book. Julie Hunt is a gifted writer, author of the Little Else books and Precious Little (with Sue Moss, illustrated by Gaye Chapman). She lives in southern Tasmania. Ron Brooks has won many awards, including the CBCA Picture Book of the Year Award three times, and is published in many countries around the world. Two of his early books, The Bunyip of Berkeley's Creek and John Brown, Rose and the Midnight Cat, both written by Jenny Wagner, are widely recognised as introducing Australian picture books onto the world scene. Two of his more recent titles are Old Pig and Fox, both written by Margaret Wild. Fox has won many Australian and overseas awards. In 2010 Ron published a memoir, Drawn from the Heart, and in 2011 a new picture book by Margaret Wild, The Dream of the Thylacine. He lives in Huonville, Tasmania. What a treat this picture book is! Julie Hunt’s charming and unusual story is enriched by Ron Brooks’ impressive illustrations. The coat of the title is not an ordinary coat: it is a flying, flamboyant entity with a strong personality that offers risky possibilities. But until the man arrives, the coat is stuck as a scarecrow in a paddock. The man accidentally liberates the coat and the coat liberates the man. With the coat on his back, the disappointed-looking man finds an entirely new way of being, becoming a showman and performer at the Café Delitzia. He grows in confidence and self-worth and the coat with the glorious past is released into a future life that is full of promise. 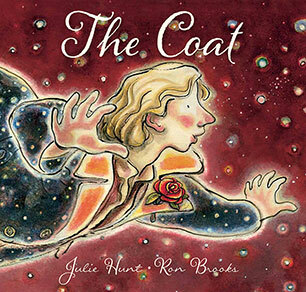 The Coat is a magical and triumphant story about freedom and transformation, a metaphor for the human potential that is in everyone. The book lends itself to use in English, Art (Brooks references Chagall’s and Brueghel’s paintings), Music and Drama lessons and would be most suited to Years 5 and up. I would particularly like to see students compose a piece of music or choreograph a dance/movement piece that the man and the coat might have played at the café, and also make their own ‘musical menus’ in the style of the dishes the man enjoys there. The Coat is definitely going into my casual teaching ‘bag of tricks’ and I look forward to sharing it with the next Year 5 or 6 class I teach. I could not wait to read this story. The cover is very enticing with the bold illustrations and the magical mysterious feel to the book. The story begins as soon as the cover is turned. The end pages begin by setting a drab dull scene with a lonesome man looking downhearted, even despondent. The story continues with the crows in the strawberry patch. We are then introduced to the coat, in his humble circumstances, full of resentment. As the story unfolds, the unknowing lonesome man plays a vital role in assisting the coat to reach its full potential. The man and the coat set off on an enlightened journey together where we learn that together they can accomplish the impossible. This story is one of those unique ones that the more times you read it, the more you discover the treasure of the text and the illustrations hidden inside. The use of language and imagery in the text is constant. The vivid scenery and beautiful watercolour illustrations (would we expect anything less?) complement the book. The illustrations detailing how the coat comes to life in the restaurant is a fantastic example for any visual literacy work, either in Visual Arts or English. Music teachers would also love to share this book with their students, to illustrate the journey of the maestro, and the reference to the accordion, the performance becoming stronger, the menu/food alluding to the music to come…and of course the words and pictures illustrating various styles of music. Who is this book for? Initially, I thought this book would be best placed in the Older Reader collection of any library.. although after having shared it with “Miss 4” she has asked for it every night. She loves how the coat comes alive and has an adventure, she loves the language (her new favourite word is splendid) and she loves the pictures changing to represent feelings and emotions. So, my recommendation is to purchase multiple copies and have them available to students of all ages and a copy for the TR collection too. When a young man finds a coat in a paddock and puts it on, great and marvellous things begin to happen. The world becomes full of flight and art and song. It is a lyrical, magical story that will put a spring in your step and a smile on your face. Perhaps the most striking aspect of The Coat is the illustrations. Ron Brooks has achieved legendary status as an illustrator from books such as John Brown, Rose and the Midnight Cat, and Margaret Wild’s Old Pig and Fox. In The Coat, Brooks makes reference to great works of art from Pieter Bruegal, The Elder and Marc Chagall. The book, which is illustrated with reed pen, brush, ink and shellac on watercolour paper, begins monochromatically, but as the story unfolds, gradually glows with beautiful soft colours. The Coat certainly has application for use in the Creative Arts classroom. The Allen and Unwin website offers some excellent Teachers’ Notes, particularly for upper primary that also include English language and literature, Visual literacy, Study of history, society and environment, Health and well-being. The notes feature numerous lesson ideas and activities and a couple of blackline masters. This beautiful book would appeal to a variety of age levels although the text set in Callie Hand, a cursive script that some younger children may have problems reading. The Coat would be a great-read aloud book to primary age children but older grades will have an even deeper appreciation of both the text and illustrations. Ron Brooks’s illustration of a flying person wearing a coat with a rose in the lapel intrigued me enough to look forward to reading the story. This sophisticated picture book did not disappoint. This story opens with a scarecrow standing guard over a field of strawberries. It is angry! It recognizes itself as a top-of-the-line coat and feels wasted as a scarecrow. A man is walking along the path and when a gust of wind fills the arm of the scarecrow, he thinks it is waving. His disappointment at finding a coat stuffed with straw annoys the scarecrow, but the man, recognizing class, dons the coat and the magical adventure begins. Despite the man’s consternation, they do perform with music that enthrals and delights the other patrons. The illustrations in the beginning are monochromatic: shades of brown and white; but as the story develops and the magic starts happening, more colour is progressively added. The end papers encapsulate this perfectly. I’m not sure if this book has a ‘message’ or not but I enjoyed the use of personification and the lovely illustrations. A delightful picture book for all ages. When a disgruntled magic coat, initially clothing a scarecrow, fills up with air and attracts the attention of a similarly disgruntled man, an adventure begins. The man, after realising that the coat is still in good condition, decides to remove it from the scarecrow and wear it himself. Despite it feeling a little too large, the man thinks perhaps he will grow into the coat. Immediately, changes start to occur and the man begins to use different language. In deciding where to go, the coat informs him that they have an appointment in “the big smoke.” Together, they take flight and soar to the Café Delitzia. After his warm welcome, the man is ushered in to the café and consumes a delicious meal. On pondering how they will pay, the coat informs him that he is there to perform. Regardless of his protestations, when the man takes up the accordion and white gloves which are hanging on the wall, he begins to play and then to sing. After a reticent beginning, the man’s singing becomes more confident. Together, he and the coat share a wonderful performance, before excusing themselves to move on to new experiences. This is another wonderful picture book which could be used with many different levels of students as the text likewise contains multiple layers of meaning. Younger students could look at the magic of being taken to different places and develop new skills, simply by donning an item of clothing. Older children could be encouraged to consider who the coat had belonged to previously and the way in which the man suddenly had abilities beyond those of which he has known himself to possess. His growing levels of confidence and happiness seemed to have been as a direct result of finding the coat. Class discussions could be held around the concept of taking risks and trying new things. Ron Brooks’ illustrations complement the story brilliantly. Starting with dull sepia toned art work and then with the gradual introduction of colour to the coat, the meal consumed by the man and later to all present in the café and the man’s environment, Brooks highlights the process of change. As a text to foster visual literacy in students, this book would be a perfect introduction. Students could look at the art works of the masters and compare Brooks’ work. Again, a wonderful pairing of artist and author in a book with so much to offer in the way of enjoyment as well as deeper content.